This great set allows you to explore your creative side whilst you can decorate the princesses and flowers to your own individual style. 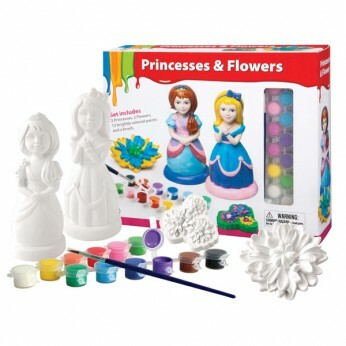 The set includes 2 princesses, 2 flowers, 12 brighty coloured paints and a brush…. This toy costs approximately £9.99 (for the latest and best prices make sure you check our retailer list for the Paint Your Dream World Princesses and Flowers above). In our review of Paint Your Dream World Princesses and Flowers we classed it as being suitable for ages 6 years, 7 years, 8 years but recommend you check the manufacturer specific advice before purchasing.